This is a conversion of the Grade II listed Old Shire Hall in Durham by Howarth Litchfield as architects and interior designers for the project. The building dates from 1896-8, by Barnes and Coates of Sunderland; with an additional east wing added in 1905. 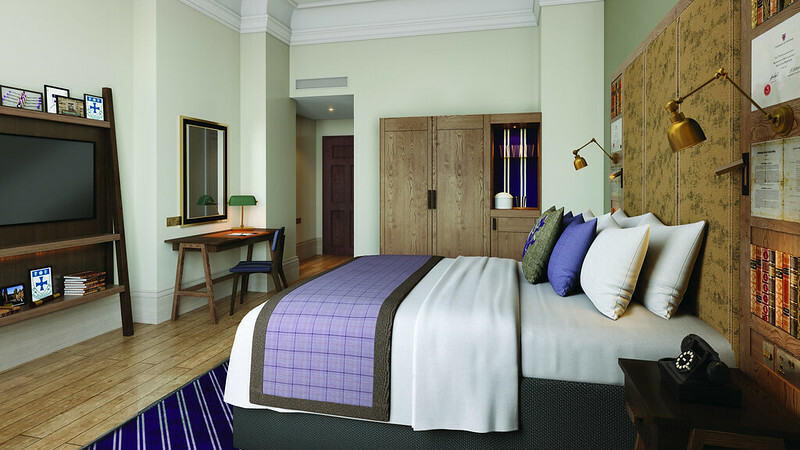 The Hotel Indigo brand is expanding with openings in 2018 including Hotel Indigo London – 1 Leicester Square, Hotel Indigo London – Aldgate, Hotel Indigo Milan – Corso Monforte and Hotel Indigo Stratford-upon-Avon. Across Europe, there are currently 24 Hotel Indigo properties with another 20 due to open over the next three to five years. A significant proportion of these are in the UK where the estate is set to double – there are currently 11 hotels with the same number due to open over the next three to five years in the UK alone. Hotel Indigo Durham is managed by Interstate Europe, a third-party hotel management company, which has 72 properties in its portfolio across the UK. The design is extremely impressive from the terracotta and red brick exterior to the corridors of Burmantofts faience tiles in blue, green, yellow and brown on walls and ceilings, stained glass and ornate staircases. The Leeds manufacturer must have been kept busy, because even the staircase balusters are glazed terracotta (faience). All the original details have been retained or renovated making a feast for the eye, including miles of corridors with glorious parquet flooring and lots of colourful stained glass depicting scenes of local industries. The hotel reception is tucked on the lower ground floor, with an old school desk with university gwon draped over its chair in the vestibule before reception, a large safe from the building next to the reception desk which itself is from the original building and antique chairs to one side. Staff greet you with natural Geordie friendliness. The steps up to the original striking entrance to the building take you straight into the Rotunda bar and restaurant, a circular lobby space that is so striking, passers-by glancing in are compelled to come in and explore. Modern quirky pieces such as an oversized black and white striped chair confirm that this is not your run of the mill city centre hotel. On Old Elvet, a ten minute walk from the historic centre of Durham and the Cathedral and Castle. the hotel has on site parking (£12 per day) and also electric charging points for cars at the front of the building. If you are getting the LNER (main East Coast line) to Durham, it’s a beautiful journey, but you will need a taxi to get into town because the railway station is at the top of a very steep hill. The 83 rooms have been designed around three different themes: Durham Cathedral, the university buildings in Durham and the scientific research carried out at the university. The rooms are on four floors, and all but two of the rooms have double beds (there are no twins). The rooms are all different sizes, with those on the ground floor having the highest ceilings. We stayed in a science themed room on the ground floor, so there were vintage prints of the periodic table, a replica of a microscope, and the headboard of the bed was framed with illustrations on clipboards attached to a wire frame. Prints of old railway advertisements of Durham, along-with Durham themed mugs for tea and coffee, add a local touch. Rooms are generously sized with deep, original skirting boards. Walls are in pale grey and furniture modern minimum in design with a dark grey theme, lifted by accents of royal blue. The roomy en suite, fully tiled in grey, includes a large step-in power shower with simple controls- just a temperature dial and a one touch button which you could switch on before you step into the shower. Rooms include a coffee maker and separate kettle with a selection of teas, plus a minibar fridge with free bottled water and soft drinks. Rooms also include a Handy smartphone loaded with data to use during your stay. Wifi is free, and the TVs allow you via Chromecast to watch entertainment from your phone including Netflix or YouTube directly on the large screen, as you would do at home. The Marco Pierre Restaurant in the old central debating (Council) chamber is a circular room with triple height ceilings and stained glass skylights at picture rail level. Seating in grey velvet is largely in booths, lending an intimate air to the room. This is where breakfast is served, a small buffet of cereals, juices, smoothies, and fruit, supplemented with a menu of hot dishes including smashed avocado on sour dough toast with smoked salmon, spinach and grilled halloumi. We also had an evening meal which was delicious, if heavy on meat and hearty courses, even in summer. Main courses ranged in prices with the steaks being more expensive but Steak and Ale pie was filling at £15.50 while starters were around £8-£10. The decoration of this Rotunda restaurant all comes from the restored chamber and there’s a gallery where on the weekend we were there people were having afternoon tea. The only slightly incongruous note are the framed black and white pictures of Marco Pierre White from several decades ago. As one of our party remarked, it made the room seem like a shrine to him. There is a small gym on the ground floor. The hotel has one meeting room – The Council Room, which can take 26 in a theatre layout. This is a magnificently converted building which is a joy to walk around and pleasure to stay in. The staff are friendly, and the location is excellent – quiet enough away from the main streets of Durham and the student haunts, but only a ten-minute stroll from the Castle and Cathedral. Spending a weekend and feeling like you a small part of history, or at least staying in it. The Rotunda restaurant with its wooden panelling and the stained glass and tile work of the corridors.